Opening night for Guys and Dolls is Thursday, Feb. 16 at the Performing Arts Center. Tessa Whitaker and Samantha Cassidy were standing center stage, flanked by ensemble cast members, about to practice a scene for the Martha’s Vineyard Regional High School performance of Guys and Dolls. Opening night was only two days away. “We’re missing our husbands,” called Tessa who stars as Sarah Brown. For Samantha, who stars as Adelaide, it was true to character. Adelaide’s fiance of 14 years, slippery Nathan Detroit, just won’t seem to commit. Nathan Detroit, played by Liam Weiland, is as smooth as his slicked back hair. He’s been running the longest floating craps game in New York since his days as a juvenile delinquent. In need of money for his next game, he bets high-roller Sky Masterson, played by Ben Nadelstein, that Sky can’t take a doll of Detroit’s choice to dinner in Havana. Sky takes the bet and has to woo good Christian girl, Sarah Brown. Guys and Dolls, a high-stakes romp of love, betrayal and canasta, is based on the work of Damon Runyon with music and lyrics by Frank Loesser. It premiered on Broadway in 1950. 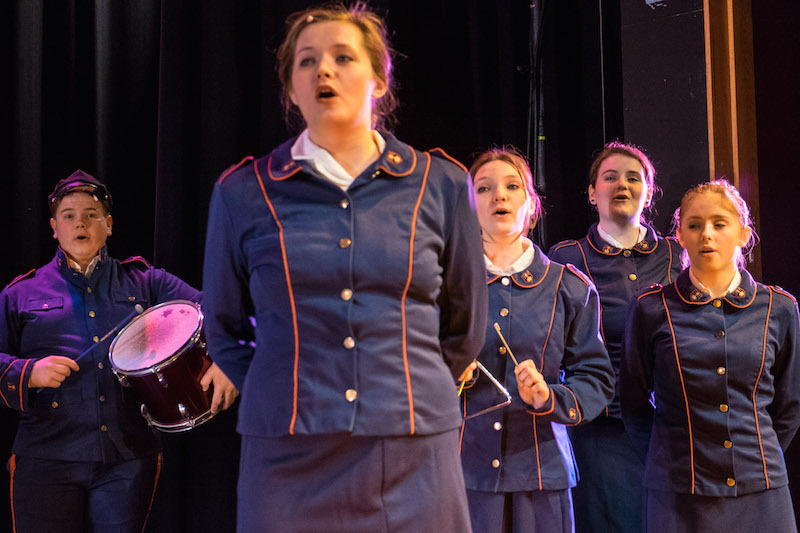 Director Brooke Ditchfield, now in her third year at the high school, said she selected the musical because of the students’ strong understanding of ensemble work. Mrs. Ditchfield said she had no doubt in the student’s talents, but the strength of some of the younger performers surprised her. “I can’t wait to work with them in the next few years,” she said. Older, more experienced performers deliver as well. “I’ve been working with Tessa for three years now and just watching her grow,” she said as Tessa took the stage. Tessa sings with high, clear notes that Mrs. Ditchfield said brings tears to her eyes every time. During one of the last dress rehearsals, in between costume changes, Tessa talked about discovering her character. She said she found everything she needed in the script, especially in the lines of others. Tessa said she could relate to Sarah’s initial rejection of Sky. “We’ve all had unwanted advances,” she said. Samantha Cassidy also looked to her own experience to flesh out her character, Adelaide. Though Adelaide is older than 17-year-old Samantha, she said she can relate to some of the emotions Adelaide is feeling. “I have a little bit of experience with guys not following through,” she said with a laugh. 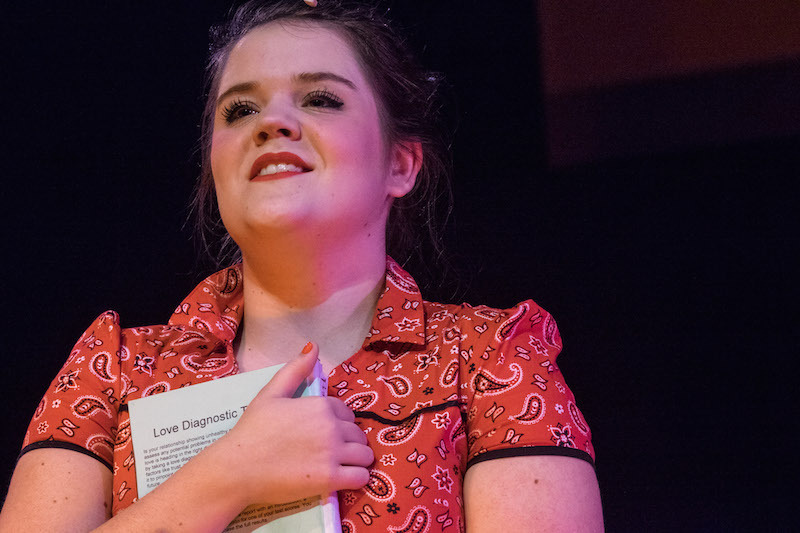 In researching her role, Samantha discovered Adelaide is often played as if she were dumb, but decided to imbue her character with more intelligence and awareness. “I make her notice things,” she said. In addition to character development, Samantha has been working on her vocal cords for the role. Adelaide’s songs are belted out and Samantha did a lot of vocal training to prepare for the show. Her on-stage fiance, Liam, also stretched his voice for the play. Liam is well known as a singer and musician, but musical theatre is relatively new terrain for him. Ben Nadelstein, a senior, is a musical theatre alumnus. He was in both Chicago and Into the Woods and does theatre camp. In immersing himself in his character, Sky Masterson, Ben said getting into costume really helped. Throughout rehearsals, he’s been exploring the complexity of Sky. Beyond capturing their characters and stretching their voices in song, the entire cast was challenged with the fast-paced choreography. Choreographer Kenny Romero said most of the students were also in Chicago last year and learned a lot of the vocabulary necessary to absorb the steps. 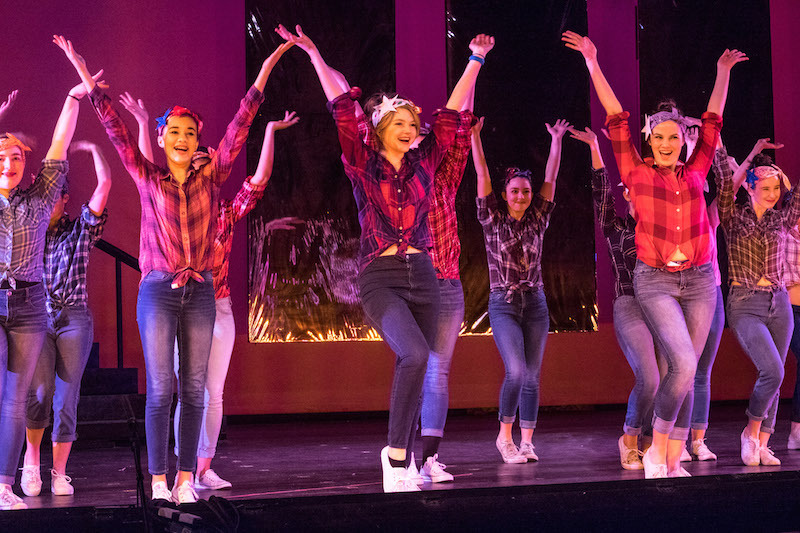 However, the slow paced stylized movements of Chicago amount to about half the movement students needed to master for Guys and Dolls. Mr. Romero pointed to junior Lizzie Williamson, a featured dancer in the production, who stepped up to take on a leadership role. “Lizzie would come 45 minutes early on a Sunday, learn all the choreography in that time, and then help me teach it to the other students,” he said. Charlie Esposito, the PAC director and the technical director for the show, also relies on the help of students. His crew is made up of about 15 to 16 students moving silently in the background. “I tell them if they do their job right, they are invisible,” he said. Students are accompanied by a live 16-piece orchestra conducted by Abigail Chandler. In the past, student musicians have played in the orchestra but because of the technical difficulty of the score this year there are only professional and semi-professional musicians. Ms. Chandler said using live accompaniment brings the experience to the next level for the students. “What makes this a job well done is that they made it their own,” she said. More pictures from Guys and Dolls. 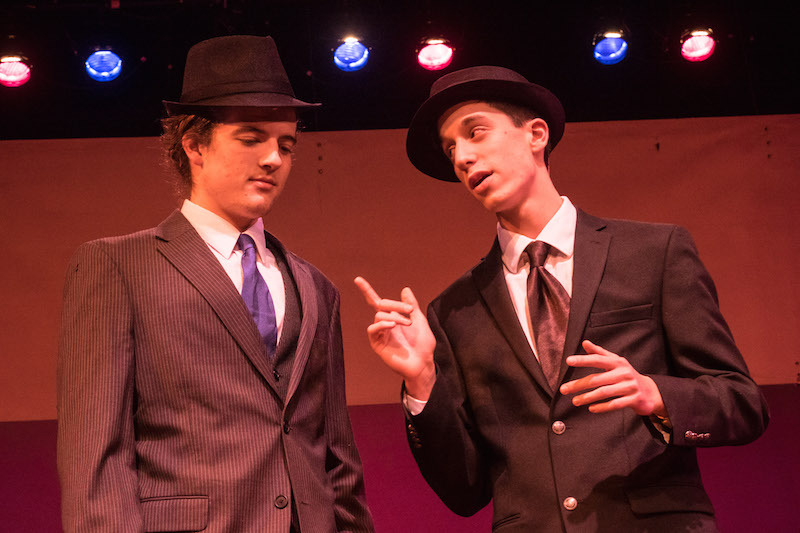 Guys and Dolls will be performed at the Martha’s Vineyard Performing Arts Center on Feb. 16, 17 and 18 at 7 p.m., and on Feb. 19 at 2 p.m. Tickets are available at the door; $10/adults, $8/kids. I saw the show last night. Bravo! I highly recommend going. Especially for folks like me nostalgic great musicals. I thought last year's production of Chicago could not be matched, but somehow they've done it again. Hats off to the whole crew at the high school.